Yesterday I got bored of my French manicure, so I decided to try out this nail polish, I got as a giveaway winner some time ago. Compared to The Essie Neon Collection '09 it's much more runnier. It is still very opaque, and one layer could work, but I went for two. 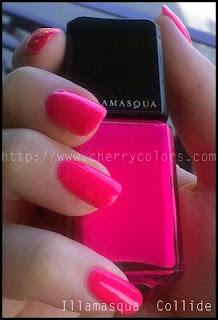 The color is a bit less neon (okay less 'wtf is on your nails') and more 'oh pretty'. Actually it is more wearable that the Essie neons. I must say that I really like it!